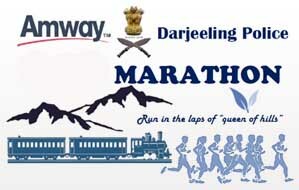 Darjeeling Police and Amway India, country’s leading Direct Selling FMCG Company, have announced that the fourth edition of Amway Darjeeling Police Marathon 2016 was held in Darjeeling in collaboration with GTA, Baghajatin Sports Club, Siliguri and Bengal Road Race Association to celebrate the 154th Birth anniversary of Swami Vivekananda. The objective behind organizing the Amway Darjeeling Police marathon is to spread awareness about health and fitness amongst people in Darjeeling and North Bengal. The sporting event is also dedicated to establish peace and harmony between people of Hills and plains. Shiny Wilson, former Indian Athlete flagged off the Amway Darjeeling Police Marathon on 12th January at Sukhika Pokhri 7.30 am and will also present the prizes at 10 am at Chowrasta. Anish Thapa , Homelal Shreshtha and Tirtha Pun from Shillong won first, second and third prizes in the Men’s Category whereas Kanchi Maya from Koju,Kathmandu, Jhuma Khatun from Siliguri, Pratima Tudu from Hoogly came first, second and third respectively in women’s category. Rajat Banerjee, Head , Corporate Affairs, Amway India also participated in the Amway Darjeeling Police Marathon and completed the marathon in 144 minutes. Shiny Wilson, Ace Athlete, Rajat Banerjee, Head, Corporate Affairs, Amway India and Amit P Javalgi, IPS, Superintendent of Police, Darjeeling and Shri Amarnath K, IPS, Additional Superintendent of Police, Darjeeling were present at the prize distribution ceremony . The fourth edition of the Amway Darjeeling Police Marathon has been a Half Marathon covering a stretch of 21 kilometers for professional runners as well as sports lovers and fitness enthusiasts in both men as well as women categories. The top rankers in all the categories were rewarded with a cash prize, a medal and a certificate. There was a cash prize of Rs 1.5 lakh for the winner; Rs. 75,000 for the first runner-up and Rs 50,000 for second runners up. In addition, there were more prizes as well as special gift hampers sponsored by Amway India for the top finishers. The fourth edition of Amway Darjeeling Police Marathon was flagged off at Sukhia Pokhri , Forest depot Ground at 7.30 am on 12th January and traversed through Darjeeling city touching vantage points like Lapchey Jagat, Puboong Phatak, Ghoom Bhanjan, Ghoom Railway Station, Dali Fatak, Darjeeling Railway Station, Padmaja Naidu Zoological Garden , Himalayan Mountaineering Institute and concluded at the Chowrasta. Amway Darjeeling Police Marathon 2017 - Anish Thapa , Homelal Shreshtha and Tirtha Pun from Shillong won first, second and third prizes in the Men’s Category whereas Kanchi Maya from Koju,Kathmandu, Jhuma Khatun from Siliguri, Pratima Tudu from Hoogly came first, second and third respectively in women’s category.